Gevgelija, is located in the southeast of Macedonia along the bank of the Vardar River, situated at the Macedonia's main border with Greece. Gevgelija is seat of the Gevgelija municipality. According to the 2002 census, Gevgelija had a population of around 15,685. Gevgelija lies at an altitude of 50 meters above the sea level. The E-75/M-1 road is passing by Gevgelija and connects Gevgelija with Skopje (165 km), Veles (106 km) and Negotino (64 km) on the north-west, and Salonica (70 km) on the south. 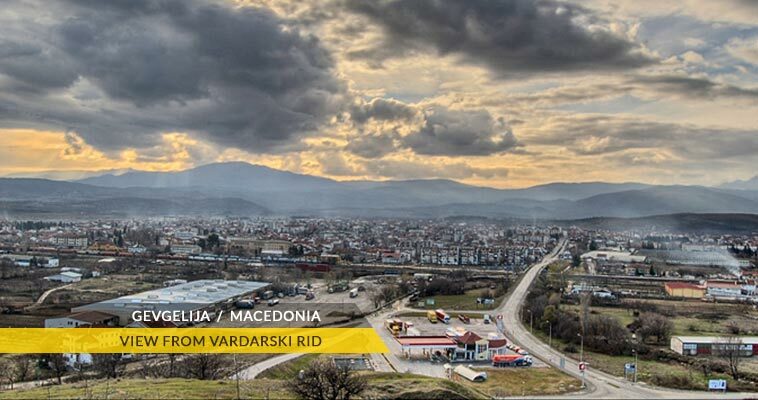 Gevgelija acts as a rail depot between Macedonia & Greece, making it a regional center. Apart from agriculture, Gevgelija also has a well developed light industry and trade. Gevgelija is also a centre for raising silkworms, an integral part of Macedonia's silk trade. Alongside its agriculture, Gevgelija economy consists of a light industry sector. Gevgelija tourism is growing, with a spa located in the nearby village of Negorci. Gevgelija has a large number of casinos located in the town and the surroundings. Gevgelija has been nicknamed The Macedonian Las Vegas because of the great number of Greeks who come to the town and visit its six casinos and numerous shops. Its position in the south of Macedonia gives it a warm, Mediterranean climate, making it well suited for the cultivation of various kinds of fruits and vegetables, including some that are typical to the Mediterranean climate, like oranges and lemons. Numerous plants of wine yards with different types of grapes are also found here in Gevgelija.